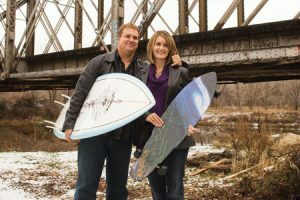 Finding family togetherness in entrepreneurship, Stephen and DeNee McBride, with their son Cory, create a successful surfboard and skateboard business. In the vast sea that is corporate America you will sometimes find someone making waves. Such is the case with Stephen L. (BS ’87) and DeNee Jenkins (BA ’87) McBride of Ogden, Utah, whose company, Kahuna Creations, caters to the surfing and skating industry. Several years ago, while working for a computer storage company, Stephen traveled to Australia for a marketing presentation. He dropped DeNee off at the beach, then scrambled to his meetings. En route, he got lost and wrecked the rental car, arriving at his presentation flustered and late. Picking up the pieces of the broken day, he made his way to the beach, rented a surfboard, and dumped his stress into the ocean. “I found relief in the waves,” he says, and soon after, he realized his days with the company were limited. “I hated what I was doing.” Within 45 days, he had quit his job. Stephen had grown up in California and attended BYU–Hawaii before transferring to BYU to earn a degree in marketing. He had developed a passion for surfing and decided to turn his enthusiasm into a new line of surfboards and skateboards. DeNee named the business Kahuna Creations, a nod to the Hawaiian pioneers of surfing. Working with other BYU alumni, Stephen and his son Cory (’10) developed the first prototypes. Then they traveled to surf and skate hot spots to attempt to make their first sale. They soon cleared their inventory and headed back to grow the company.